The National Oceanic and Atmospheric Administration (NOAA) GOES-16 satellite image of the bomb cyclone moving up the East Coast in January 2017. A cyclone of historic proportions is underway across the United States, according to the National Weather Service (NWS). The winter storm, Ulmer, has led to terrifying blizzard conditions, tropical storm winds and heavy rainfall in the Great Plains, Rocky Mountains, the Mississippi valley and the Great Lakes region, killing one person. On March 13, 2019 “as the blizzard developed, heavy snow lashed northern Colorado, including Denver, western Nebraska, eastern Wyoming, central South Dakota, and southeastern North Dakota,” says an Accuweather report. The NWS recorded as many as 350 gusts of wind with speeds above 80 kilometre/hour in a 24-hour period with the highest being above 160 km/hr at Colorado Springs. The agency received 92 reports of damages caused by such winds. It also recorded at least seven locations with over a foot of snow. “Snowfall totals so far are as high as 16 inches in the mountains of Colorado, with 5.2 inches reported at Denver International Airport and about 4 inches in the Boulder area,” said Faith Eherts from Accuweather. The intensity of the winds and snow is high because this is no ordinary cyclone. It has been through a process of rapid intensification leading to ‘bombogenesis’ — converting it into a rare bomb cyclone, which looses barometric pressure or the pressure of air in the atmosphere in a very short span of time. 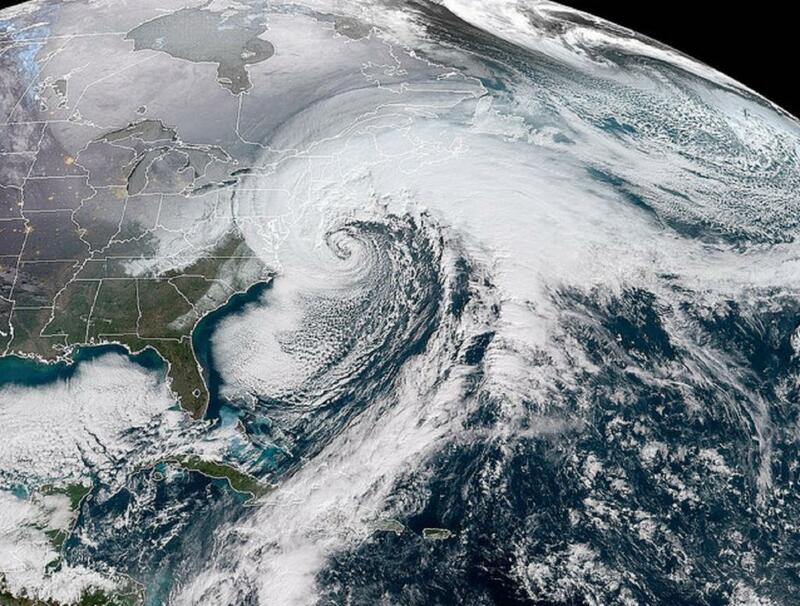 A bomb cyclone looses around 24 millibars of air pressure in a span of 24-hours. Normally, drop in air pressure is accompanied by inclement weather conditions such as rains and wind, but in the case of a bomb cyclone the drop is so drastic that the situation becomes very severe very quickly. “This can happen when a cold air mass collides with a warm air mass, such as air over warm ocean waters,” says the National Oceanic and Atmospheric Administration (NOAA) on its website. Air from the surrounding areas rushes to fill in the spaces left open by the two colliding air masses, precipitating the stormy conditions. The current Bomb cyclone has broken previous records of barometric pressure in many places. For instance, “according to preliminary NWS data, Colorado and New Mexico broke all-time low barometric pressure records on Wednesday,” says Accuweather. Dodge City in Kansas recorded its lowest barometric pressure in 100 years at 974.9 millibars. A warming world has increased the possibility of the occurrence of such intense storms, though scientists say that directly attributing this storm to climate change would not be possible at this point in time. “There isn’t a direct link between the slowly changing climate and this event,” Jonathan Martin, a climate scientist at the University of Wisconsin-Madison, told the media. A month ago, large swathes of the US were in the grip of extraordinarily cold weather due to intense winter storms. This had happened due to the rupture of the Polar Vortex into three smaller vortices around the start of the year. For the last two years, the breaking of the Arctic stratospheric vortex has brought severe winter conditions and this developing trend could be a result of climate change. For example, in 2016, a paper published in the journal Nature Climate Change had found that the Stratospheric Polar Vortex has shifted and weakened over the past three decades, increasing the intensity of cold winds coming in from the Arctic. Another paper, published in February 2018, also showed that in the last 37 years the frequency of weak vortex states in January and February had increased and 60 per cent of the cooling observed in mid-latitude Europe and Asia since 1990 could be attributed to this phenomenon. The paper also found that the reason for persistence of these weak vortex states is the high sea pressure created by the loss of Arctic sea ice which is a direct result of global warming caused by the emission of green house gases.